I have known Jodi for over 20 years. We started at A&M Records on the same day and worked together side-by-side for nearly a decade. There are several words that best describe Jodi: warm, passionate, dedicated, organized, and efficient. Nothing fell through the cracks with Jodi. I have searched high and low to find someone who has the organizational and follow-through attributes of Jodi and have been disappointed repeatedly. She is truly amazing. Jodi is one of a kind and I'm lucky to know her. CEO, Owner, Co-Founder / Fanscape, Inc.
Of the many artists' representatives I've worked with over the years, Jodi (when with LBR Entertainment) was the most detail-oriented, the most thorough and the most enjoyable to work with. Working with our extremely demanding clients, Jodi effortlessly juggled the collective needs of everyone involved quickly and always with mutual beneficial outcomes. Jodi is keenly aware of people's needs which makes her invaluable in any setting. I worked with Jodi for over 2 years as her supervisor and have stayed in close contact through our shared involvement with the Los Angeles Chapter of CAMFT. Jodi is an excellent therapist; bright, warm and caring in her work with clients with a wide range of backgrounds, ages, ethnicity and interests. If you are looking for help as a client or to work with her in an agency, I give her my highest recommendation. I worked with Jodi at A&M Records and found her to be a highly organized, creative problem solver with a keen eye for results. I am happy to give Jodi my highest recommendation. Jodi has an outstanding work ethic. She is dedicated and result oriented; always able to get the job done and a pleasure to work with! I have known Jodi Milstein, LMFT for over 25 years throughout her professional careers in the music industry and as a psychotherapist. Her determination, passion and good will to provide others with excellence is in her nature. Jodi intuitively utilizes her previous experience as a music industry executive to now successfully work as a therapist with creative individuals by providing a comfortable, confidential, therapeutic environment. She is a kind, caring and nurturing therapist. Jodi's extensive training and experience in the areas of addiction, chemical dependency, and eating disorders is exceptional as well. Anyone working with her will feel well taken care of as she works in the most humanistic and professional manner. I refer often to Jodi Milstein LMFT, and the feedback continues to be positive, strength based outcomes in assisting others in finding true connection and meaning in life. If you are interested in working with someone who epitomizes trustworthiness, responsibility, patience and commitment to the individuals with whom she works, Jodi is the perfect match. Her core skills include understanding how to create demand, which she learned while working in the Artist Development and Marketing Departments at A&M Records. In addition to this, Jodi became skilled at communicating effectively between disparate groups of individuals, who often needed Jodi clarity of vision, steadfastness and arbitration to find common ground solutions to any number of problems. Jodi is passionate about the work she does and views the process as a collaborative one. Her prior work experience in the music industry allows her to bring a special awareness to her sessions that not everyone can offer. I had the opportunity to work with Jodi during her time at A&M in the artist relations department. I can't think of a better training experience for her role today as a therapist, than working in an artist relations department at a record label. That position was all about relationships; understanding the needs and issues of a diverse group of individuals, and keeping the delicate balance between the artist and the label. Jodi was exceptional at her job and it was a pleasure working alongside her. I highly recommend her both personally and professionally. Jodi is empathic, intuitive and grounded. She is warm, kind, and consistent. She is not afraid to think out of the box, and her years of working in the entertainment industry enrich and inform her ability to shepherd clients through both their creative and non-creative processes to live more whole, complete lives. I would recommend Jodi as a therapist without reservation. I have known Jodi for more than a decade and she has always been a great support, wise guide, committed and dedicated colleague, and so much more. She has a huge heart, keen sense of intuition and the ability to bring it all together through powerful communication that causes transformation in others. You can count on her with your life. I have known Jodi Milstein since 2005 when she began working for Phoenix House Academy as a Family Therapist. I was her administrative and clinical supervisor from 2005 to 2008. Jodi demonstrated sound clinical skills working with a high-risk population of co-occurring disordered adolescents, many with trauma, chemical dependency, eating disorder and/or criminogenic histories. Jodi demonstrated knowledge of current clinical methodologies and specific techniques for treating these hard-to-treat populations. She would always share her knowledge with her colleagues and would likewise consult with her supervisors when necessary. Jodi was always able to handle high-stress and crisis situations in a professional manner. When confronted with a problem or obstacle, Jodi would use her critical thinking skills to find an appropriate resolution, whether it involved staff, clients, policy, or process. Jodi always was willing to contribute to team efforts and take on additional responsibilities, even if she was not asked to do so. She was actively involved in the implementation of several evidence-based practices. Jodi would always take initiative in finding answers to problems, including providing resources for clients and families, researching current best practices protocols, or finding data to substantiate administrative requests or clinical needs of the client population. Jodi documentation was always legible, timely, professional and meeting all requirements of the agency. From narratives to technical writing to emails, Jodi was very adept at communicating succinctly, clearly and effectively. Jodi is a self-starter. She is autonomous, takes initiative and does not require a lot of close supervision. In sum, I highly recommend Jodi Milstein as a member of any clinical team. With pleasure, I recommend the services of Jodi Milstein, LMFT. 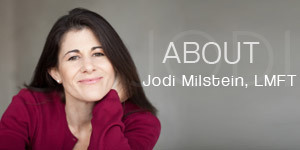 A veteran of the music industry having worked with chart-topping talent for decades, Jodi has the ability to understand the unique challenges of the "industry" and bring about positive change for artist, group, and individual. Stay connected, sign-up for my Newsletter! As a former music executive, I have unique insight into the music business. My specialty is integrating that knowledge along with my expertise as a licensed therapist. I now work with bands, individual artists, and musicians to improve professional group dynamics as well as personal relationships. I can help direct energy toward positive communication while enabling artists to maintain their creative edge. I am an expert in this area and I can help. As a Clinical Member of California Association of Marriage and Family Therapists (CAMFT), Jodi Milstein, LMFT meets and exceeds the professional and ethical standards as set forth by her peers and professional licensing board.